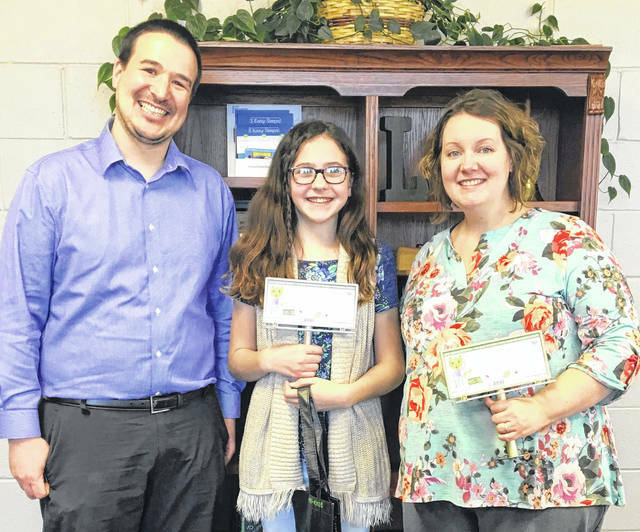 Matalyn Magee, center, and her teacher, Angela Buller of Lynchburg-Clay Elementary, right, are pictured being awarded the first prize in the 2019 Recycling and Litter Art Contest from Clinton Davis of Highland County Community Action representing the Highland County Recycling and Litter Program and the RPHF Solid Waste District. The Ross Pickaway Highland Fayette Solid Waste District recently concluded a Recycling and Litter Art Contest for fifth graders in each of the four counties of the district. The district said there were so many good submissions from students in Highland County that it was very hard to pick a winner. It also said it wanted to thank all of the students and teachers for their art work and care for promoting recycling and litter clean up. You can see her art throughout the month of April on a billboard just north of Hillsboro on SR 73 (on the left hand side of the road as you drive north toward New Vienna). If you have any questions about public recycling bins or want to sponsor a litter cleanup event (supplies funded by the Ohio EPA) call the Highland County Community Action Organization, Inc. at 937-393-3458 ext. 117 or visit hccao.org/recycle. The annual tire and electronics collection event will be on June 8 from 8 a.m. until noon at 1487 N. High St. in Hillsboro. Submitted by Clinton Davis, recycling and litter outreach specialist for Highland County.